It is with heavy hearts that we announce the passing of our dear colleague, mentor, and friend, James L. Malone. An Emeritus member of the Management Committee of Reminger Co., LPA, Jim passed away on March 28, 2019. Hailing originally from upstate New York, Jim graduated from The University of Notre Dame in 1968, and thereafter, the University of Cincinnati School of Law. He joined Reminger in 1973 as a trial lawyer. Jim practiced at Reminger for forty years until his retirement in 2013. Over the course of his distinguished and illustrious career, Jim established himself as the premier litigator in the medical malpractice arena, defending countless hospitals, physicians, and health care providers. His reputation as a formidable adversary in the courtroom grew as he handled increasingly complex and high-profile cases. In fact, Jim served as first chair counsel for well over 100 medical malpractice jury trials in courts throughout Northeast Ohio. In 2002 he served as Lead Counsel in the trial of a matter which was hailed by the National Law Journal as the most significant defense verdict of the year. He was highly involved in the legal community as an 8th District Judicial Conference Life Member, plus as a member of Defense Research Institute, the Ohio Association of Civil Trial Attorneys, the International Association of Defense Counsel, and the Ohio State Bar Association. Jim believed strongly in giving back to the community, as he volunteered with The Ronald McDonald House and the Case Western Reserve University School of Medicine. Jim previously served on the Board of Governors for the Meridia Health System. Most importantly, Jim was a husband, a father, and grandfather. He leaves behind his wife Kathy, sons Kevin and Patrick (Track), daughter Stephanie (Teeter), and six grandchildren. We are honored that we had the privilege not only to work with Jim, but also to share a lifetime of camaraderie and friendship. His talent and guidance helped shape the culture of our firm. 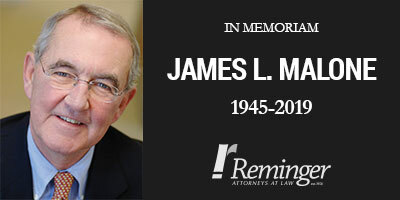 He will be missed greatly by our Reminger family and the field of law.